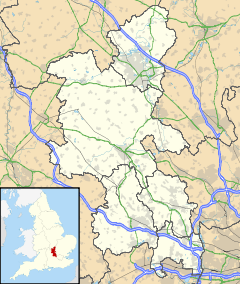 Chearsley is a village and civil parish within Aylesbury Vale district in Buckinghamshire, England. It is situated about seven miles south west of Aylesbury, and about four miles north of Thame, in Oxfordshire. The village was mentioned in the Domesday Book of 1086 as Cerdeslai. It was originally a hamlet in the nearby parish of Crendon.It was established as a parish in its own right by the Bishop of Lincoln in 1458. The village name is Anglo Saxon in origin, and means 'Cerdic's clearing' or 'Cerdic's lea'. The incidence of Brittonic personal names in the royal genealogies of a number of "Anglo-Saxon" dynasties is significant. The Wessex royal line was traditionally founded by a man named Cerdic, an undoubtedly Brittonic name ultimately derived from Caratacus. This may indicate that Cerdic was a native Briton, and that his dynasty became anglicised over time. The village was used as a location in the television series Midsomer Murders – ep. Country Matters, ITV. Wikimedia Commons has media related to Chearsley. River Thame at Chearsley, view from footbridge at the Cuddington parish boundary. Parish Church of St Nicholas, Chearsley. This page was last edited on 7 December 2017, at 20:56 (UTC).